signals to men controlling aerial rope, to warn them to raise, lower, or despatch loads. conveys asphalt in pails or barrows to asphalter (579) (q.v.) and shoots it on surface to be laid with asphalt; sometimes also stokes asphalt boiler and stirs boiling asphalt. shovels ballast into revolving pan of ballast crushing machine; controls, by means of lever, power-drive of machine; watches ballast in pan to see that it is crushed to required fineness; empties pan, with a shovel, upon completion of crushing. assists ballast crusher (q.v.) in filling and emptying pan of ballast crushing machine; wheels away crushed ballast to spot where it is being used, etc. carries out necessary repairs, concreting, timbering, etc., to banks of canals or rivers, or to waterworks supply channels or filter beds, under instructions from bank walker (561) (q.v.). releases and tips over contents of "skip" or tub, which tips to each side, used for transporting sand, stones, etc. removes earth or rock excavated by mine or well sinker, by shovelling into trucks or wheelbarrow from stage on which earth is thrown by sinker, or by emptying into trucks, buckets or tubs brought up by winding apparatus at top of shaft. mixes concrete for repair of cement canal banks, and wheels it where required, or, drives small piles into bottom and erects timber supports for canal bank, where made of timber; or, clears out and dredges canal as directed; does any other labouring work connected with maintenance of canal banks or channel or other canal works. repairs earth-slips or other defects in canal banks as indicated by bank ranger (q.v.). holds in position cement gun, worked by air pressure, which squirts liquid cement into cracks in brickwork or masonry, or sprays it against surface of building previously coated with metal lathes, or against brickwork surface, clay burner (building); a labourer who digs clay sub-soil from building foundations and burns clay for use in garden paths and for general ballast purposes; mixes crushed coal or breeze and, spreading clay and breeze in layers, sets fire to whole; trims fire according to prevailing winds and adds fresh clay and breeze at intervals throughout day; cf. clay burner (railway) (577). tends and feeds with dry mixed ingredients, a power driven concrete mixing machine; cf. concrete mixer (579). shovels stone, bricks, ballast, etc., into pan of crushing machine ; as for ballast crusher. a miner (q.v.) who excavates earth inside cylinder or caisson, so sinking if for bridge foundations; usually works in compressed air chamber. navvy or miner (q.v.) engaged in sinking deep holes or shafts. lays drain pipes in trench dug by navvies (q.v. ), taking care that pipes are laid at an even gradient, and either straight or, if required, at proper angle; tests gradient by erecting "blocks," of one or two bricks, at intervals and placing spirit level thereon; uses line and cord attached to pegs, which he drives into ground, to get proper alignment; sometimes also does work of pipe jointer (q.v.). assists cable and service layer (578) (q.v.). a navvy (q.v.) who digs foundations of buildings, trenches for drains, gas mams, etc., and who assists in any blasting operations that may be necessary. shovels excavated soil or other material into barrows, tubs, wagons, etc., for removal; sometimes also wheels barrows or pushes tubs, which run on a light railway, to place where material is to be dumped, empties them, and brings them back. tends fire in brazier for use of gang of ballastmen or platelayers, and boils water for tea-making; keeps men supplied with drinking water. assists flagger or street mason (579) (q.v.) by mixing mortar or cement with shovel; lifting stones into position; ramming stones into bed; minding tools, etc. assists in making of granolithic stone, an artificial stone made of crushed granite and cement; tends mixing machine, pours mixture into moulds; removes set slabs from moulds, etc. digs with pick, spade and shovel graves in cemetery or churchyard; fixes retaining walls of wooden boards and struts; lowers coffin by ropes into grave; refills grave with earth after burial ceremony. excavates and makes concrete foundation; erects and beds down lamp posts in road construction, etc., ready for gas fitter to fit lamp and for service layer to connect with main; usually works under supervision of service layer. leading hand of a gang of men, working under a ganger, and replacing him when he is absent; usually named according to the work done, e.g. leading ballast loader, leading roadman. spreads macadam, i.e., broken granite with a surface dressing of powdered granite, with shovel or fork; during steam rolling operations, sweeps water and exuded mud over surface of road metal. does unskilled work, e.g., excavating, holding tools, in mine sinking operations. does excavating under ground usually with hydraulic tools and blasting apparatus, in construction of tunnels for railways, roads, sewers, canals, etc., or foundations of bridges, buildings, etc. ; shores up sides and places sections of steel linings; sometimes specifically designated, e.g., canal miner, land miner, public works miner, railway miner, sanitary miner, sewer miner, tunnel miner. excavates soil for building foundations, railway tracks, roads, docks, canals, drains, etc., using pick and shovel; often does concreting and timbering work; sometimes specifically designated, e.g., canal navvy, excavator, road maker, trench digger. works at pond or pit in which cement is mixed for use in road making; tips in cement from bags; controls flow of water from taps; mixes water and cement with long handled rake. assists pavior (579) (q.v.) by mixing cement, moving stones, etc. assists platelayers and packers on railroad construction and repair work by doing unskilled and heavy jobs such as shovelling, wheeling, and lifting of material. labourer who sorts stones or setts by hand according to size. does unskilled jobs such as digging and carrying soil or rock, lifting piles with help of derrick, and placing them in position, or assisting carpenters or masons, metal or other workers, in pier construction work. operates pile driving machine which releases a weight, raised by hand or mechanical power, and so hammers the pile home. guides piles, which are slung by means of cranes, into prearranged position ready for pile driver (q.v. ), using ropes attached to piles to guide them. fits plain end of one pipe into socket of another; caulks joint with cement; passes special form of mop into pipe to remove any cement which may have found its way through joint into pipe. breaks up surface, if necessary, with sledge hammer and wedges, "cold chisels," or with pneumatic hammer; excavates trench for pipe track, with pick and shovel, removes excavated soil in barrows, etc. a labourer who shoots stones from cart in heaps on road ready for spreader. a navvy (q.v.) who digs out ponds, and lines the sides and bottom with concrete to make them waterproof. boils and ladles out pitch or tar used in road making; attends to fire under pot or cauldron; breaks up and replenishes cauldron with solid pitch; stirs cauldron with long iron rod. a pot man (q.v.) heating and distributing asphalt. stokes fire which heats asphalt powder in preparation for laying, and stirs powder to distribute heat; sometimes also fills pails, etc., with roasted powder and takes it to asphalt layers (579) (q.v.). does unskilled work in construction of roads, bridges, railways, canals, etc. feeds and tends pug mill, in which stone, brick, rubble, etc., is ground and mixed for manufacture of mortar, concrete, etc. fills in and rams down earth, clay, etc., on drainage excavations, etc. ; usually done by navvy, as part of excavation or trench digging work. does any labouring work connected with maintenance or repair of banks or channel of river supplying waterworks; cf. canal bank labourer. sweeps and cleans up road before tar spraying, and after road making or mending is completed; cf. road cleaner (970). contracts with a local authority to keep in repair a certain length of road with materials supplied by them. (ii) throws or shovels pieces of rock into pan of crushing machine and shovels out crushed rock, cf. ballast crusher. hoists loads of building material to scaffolding, with rope running over a pulley. attends to scarifying apparatus, i.e., apparatus for tearing up the worn surface of a road, on a steam roller; directs steam-roller driver and maintains teeth of scarifier at correct adjustment by hand with spanner or with manipulating bolts. maintains in repair sea walls, groynes, embankments, etc., with stone, rubble, or brickwork; usually a mason (572) or bricklayer (565) (q.v.). assists sea defence worker (q.v.) in building; maintenance of sea groynes, etc., by doing unskilled work, e.g., carrying or wheeling blocks of stone and timber, mixing cement, etc. fills in space between drain or pipe section and loose soil with a slurry of cement and sand. a rammerman (q.v.) who rams down setts with a heavy hand-ram, a one or two handled beam of wood, into bed of slurry. (ii) in Ireland, a general term for a ditcher. spreads tar, tar mixture, or other similar substance, with brush, over stone or clinker to be rolled. sits by roadside and breaks stones, usually flints, with hand hammer into sizes suitable for road mending; is usually an old man. spreads stones ' evenly on surface of road, with shovel or fork, prior to rolling. general labourer waiting on pavior (579) or road, maker (q.v. ); does heavy unskilled work in street or road making. maintains, by means of pick and shovel, level and alignment of road surfaces or of tramway permanent way beds, as shewn on pegs placed in position by surveyor; cf. surfaceman (railway) (577). a tar pavior's labourer (q.v.) who breaks up pitch or bitumen, by hand with hammer and iron spike, and mixes it with tar, in right proportion to be used on road surfaces; assists pot man (q.v.) and may sometimes stoke boiler; carries buckets of hot tar when and where required. assists tar pavior (579) (q.v. ); generally engaged in filling or barrows with tar paving mixture and wheeling of barrows to tar pavior; may assist in spreading mixture and help in rolling laid surface. (ii) works handle of pump which forces tar through pipe or tube through tube to rose of sprayer. puts up timber supports and crossbeams in trenches; does all timber work required on public works, etc. 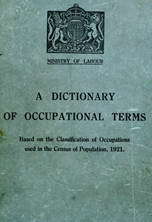 does unskilled work in excavation and boarding up of trenches. responsible for excavation of trenches for pipes, mains, drainage and other purposes. (ii) a labourer employed underground in cleansing sewers and the like. keeps water trenches on sewage works and sewage farms, and drainage ditches, clear and free from obstructions. assists well sinker (580) (q.v. ); hauls out excavated material with windlass, rope, and bucket; lowers timber, tools, etc., as required. a navvy or labourer (q.v.) who wheels away and deposits soil. does unskilled work, such as trench digging, shovelling, wheeling material, loading and unloading supplies, tools, etc., in work of construction, road building, etc.